Described by the composer himself as ‘the king of instruments’, the organ and its music form a small but not insignificant part of Mozart’s vast catalog of compositions. Mozart's renowned skill as an improviser at the organ combined with the very limited scope for original organ composition in eighteenth-century Austria meant that he actually wrote down very little music specifically for the instrument. The two best-known 'organ' works, K594 and K608, together with the delightful Andante in F, were composed for a mechanical organ in a museum owned by a Bohemian nobleman, Count Joseph Deym. At the same time as he composed these three pieces, Mozart wrote an Adagio and Rondo for glass harmonica, flute, oboe, viola and cello (K617) which, along with the Adagio in C for glass harmonica (K356/617a), was also arranged for Deym's mechanical organ. The remainder of Mozart's organ music consists of Fugal compositions mostly written for other instruments (but clearly with the organ in mind). 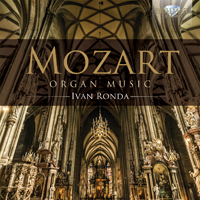 Ivan Ronda is an organist particularly renowned for his authoritative interpretations, and is acknowledged for his fine technique. He was the first Italian organist to record an album on the historic Baroque organ of the Johanniskirche in Lüneburg, an instrument known to J. S. Bach.